Mr. Glasscock is a native Texan who has spent most of his life in Houston. He attended public schools, graduated from Texas A & M University and attended Rice University where he received a M.S. in Mechanical Engineering in 1961. 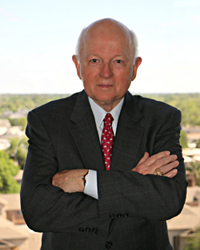 Following active duty in the United States Air Force, Mr. Glasscock joined Mobil Chemical Company in 1964 as a design engineer at the Olefins and Aromatics complex in Beaumont, Texas. In 1968, he became a sales representative in Mobil Chemical’s Houston office, leaving in 1973 to join Texas Olefins Company as an independent marketer of pyrolysis gasoline and other olefin unit co-products. In 1980, Mr. Glasscock, by agreement with Texas Olefins Company, spun off his profit center and formed Texas Aromatics, LP, a chemical marketing company specializing in C5 and heavier co-products from major North American chemical manufacturers. Mr. Glasscock has served as President and CEO since the company’s inception, guiding it to its present scope as an independent marketer and service company. Texas Aromatics serves its suppliers and customers in five distinct product centers: aromatic feedstocks, specification olefins and aromatics, heavy fuel oils, gasoline blendstocks, and NGL’s/crude oil. Texas Aromatics is proud of its many long term relationships and its ability to work with its suppliers and customers to solve problems when they occur. With over 300,000 barrels of tankage and long term barge commitments, Texas Aromatics is able to provide reliable service to its suppliers and customers.